Many of these awards are presented together with the relative certificates and/or promotions but most are recommended by or requested to the commanding officer of the eligible awardee. The use of the award ribbons and/or medals with authorized uniforms is optional, but recommended. Unless specified, devices are not added to the awards, even if that is not explicitly mentioned in the awards USN Third Fleet SL criteria.. All the awards must be justified by documented actions, even if the award USN Third Fleet SL criteria does not explicitly include that requirement. Note that the USN Third Fleet SL criteria for these awards is adapted to Second Life service and the military careers of the awardees in that context. Some have approximate meaning and/or reason and some have completely adjusted criteria to fit said context. In case the awardee has a documented context parallel to and intimately connected to his or her Second Life naval career, equivalence is granted - such as in the case of service with United States based military groups recognized by the USN Third Fleet SL, like long established and reputable groups in the same timeline, as long as prior to USN Third Fleet SL service, or WW2 timeline (Virtual United States Coast Guard (before VCG), WW2 USN groups, Second Life Coast Guard, Seychelles Isles Coast Guard, American Volunteer Group, Bastogne region WW2 groups, among others). This is also valid for the application of devices on the medal cloth and ribbon. Next to each award is a summary of the real life award's criteria. None. This medal is not awarded in Second Life as it is awarded in real life by the Congress of the United States. It is represented here as a reminder of the highest award bestowed upon a real life navy service member, and as a front cover for this section. The highest U.S. military decoration, awarded by Congress to a member of the armed forces for gallantry and bravery in combat, at the risk of life and above and beyond the call of duty. Also called Congressional Medal of Honor. Originally the Medal of Honor (MH) was only presented to the enlisted, but on March 3, 1863 this was extended to officers as well, with the exception of naval service. On March 3, 1915 the president was authorized to present "a suitable Medal of Honor to be awarded to any officer of the Navy, Marine Corps, or Coast Guard who shall have distinguished himself in battle or displayed extraordinary heroism in the line of his profession." Previously the award was reserved for naval service enlisted personnel ONLY, but this act made it available to officers as well. Awarded by recognition from the United States Navy Third Fleet in Second Life for continued action in furthering the advancement of Third Fleet, while in active duty as a naval officer/enlisted, through documented outstanding contributions in three or more areas of naval service (land management, recruitment, training, active duty, regulation, etc.) for a period of three consecutive years with no more than six months of allowed absence possible during that period. Awarded to Senior Command Officers and Flag Officers by the United States Navy Third Fleet in Second Life to recognize members who have provided exceedingly valuable service to the group for a documented period of two consecutive years with four months of allowed absence possible during that period. Awarded to Third Fleet officers/enlisted who have displayed exceptionally meritorious conduct in the performance of outstanding services and achievements. The performance must be of significant importance and far exceed what is expected by normal standards. To be eligible for this award the awardee must have a naval career of at least 24 consecutive months with two months of allowed absence possible during that period. The Legion of Merit Medal (LM) is a decoration presented by the United States Armed Forces to members of the United States Military, as well as foreign military members and political figures, who have displayed exceptionally meritorious conduct in the performance of outstanding services and achievements. The performance must be of significant importance and far exceed what is expected by normal standards. Awarded to foreign born Third Fleet officers who have displayed exceptionally meritorious conduct in the performance of outstanding services and achievements. The performance must be of significant importance and far exceed what is expected by normal standards. To be eligible for this award the awardee must have a naval career of at least 24 consecutive months with two months of allowed absence possible during that period. The Legion of Merit Officer Medal (LMO) is a decoration presented by the United States Armed Forces to foreign military members, who have displayed exceptionally meritorious conduct in the performance of outstanding services and achievements. The performance must be of significant importance and far exceed what is expected by normal standards. When the award is presented to foreign parties, it is divided into separate ranking degrees. The degrees of Officer - issued to a general or flag officer that is below the chief of staff, colonel or equivalent rank. Awarded to Third Fleet officers/enlisted who distinguish themselves in continued support of operations by "heroism or extraordinary achievement while participating in aerial flight," for at least 12 months. To be eligible for this award the awardee must have a naval career of at least 12 consecutive months with two months of allowed absence possible during that period. The Distinguished Flying Cross Medal (DFC) is an award that is bestowed upon any officer of enlisted personnel of the United States Armed Forces who distinguishes themselves in support of operations by "heroism or extraordinary achievement while participating in aerial flight." The medal was created on July 2nd, 1926 and the first awards were bestowed by President Calvin Coolidge on December 21st, 1927 to ten Army Air Corps aviators who participated in the US Army Pan-American Flight. Two of those awards were bestowed posthumously as they had died in a mid-air collision during that flight. The first person to actually be presented with the medal was Charles Lindbergh after returning from his trans-Atlantic Flight. None. The Purple Heart is a WAR THUNDER pilot recognition award, and it must be earned in that platform. No disrespect towards our real life wounded warriors, it is a reflection of the War Thunder Purple Heart medal and it means the bearer flies combat missions in that platform. 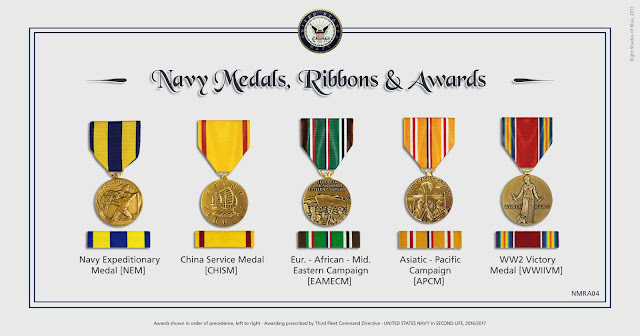 Awarded to Third Fleet officers/enlisted to recognize superior and exceptional non-combat service that does not meet the caliber of the Legion of Merit Medal. To be eligible for this award the awardee must have a naval career of at least six consecutive months with no interruptions. The Meritorious Service Medal (MSM) is a decoration presented by the United States Armed Forces to recognize superior and exceptional non-combat service that does not meet the caliber of the Legion of Merit Medal. As of September 11, 2001, this award may also be issued for outstanding service in specific combat theater. The majority of recipients are field grade officers, senior warrant officers, senior non-commissioned officers and foreign military personnel in the ranks of O-6 and below. 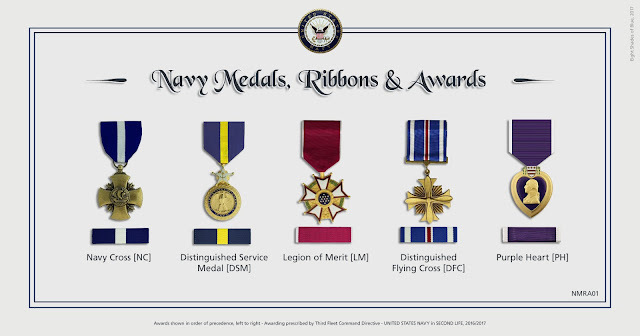 Subsequent awards are denoted by bronze oak leafs for Army and Air Force members, and gold stars for Navy, Marine Corps and Coast Guard members. Awarded to Third Fleet officers/enlisted for meritorious achievement while participating in aerial flight; awards may also be given to acknowledge single acts of merit or heroism. The U.S. Navy and U.S. Marine Corps possess two types of Air Medals: "individual" for singular meritorious acts and "strike/flight" for participation in sustained aerial flight operations. Bronze Strike/Flight numerals denote "strike/flight" awards and for "individual" AM's the valor device may be authorized. Awarded to Third Fleet officers/enlisted above O-4 or above E-6 who, performing the duties of or equivalent to those of a senior officer/enlisted, while serving as a senior on a joint military staff (together with other recognized Second Life military groups of any nationality), have performed either an exceedingly heroic act, exceptional achievement, or commendable service that has not been recognized by a higher award. For Third Fleet officers/enlisted. Awarded by earning a sixth Navy and Marine Corps Medal. This award is presented as symbol of exceptional achievement in the development of multiple skills/specialties. No devices applied. Awarded to Third Fleet officers/enlisted below O-4 or below E-6 who, while serving in a joint military command or activity (together with other recognized Second Life military groups, members of the Third Fleet group or others, of any nationality), have performed either an exceptional achievement or commendable service that has not been recognized by a Commendation Medal. The Joint Service Achievement Medal (JSAM) is a decoration presented by the United States Secretary of Defense to officers below the grade of O-6 and enlisted members below the grade of E-7 who, while serving in a joint military command or activity, have performed either an exceptional achievement or commendable service that has not been recognized by a Commendation Medal. Subsequent awards are denoted by Oak Leaf Clusters worn on the service medal. For Third Fleet officers/enlisted. Earned by acquiring initial warfare designation (SWO, AWO, ESWS, EAWS, SS), by graduating from Naval Aircrew Candidate School (NACS) with the SLMC or by completing Primary Flight Training (PFT), achieving SEAL Trident or Parachute Wings or by completing the SAR training program. 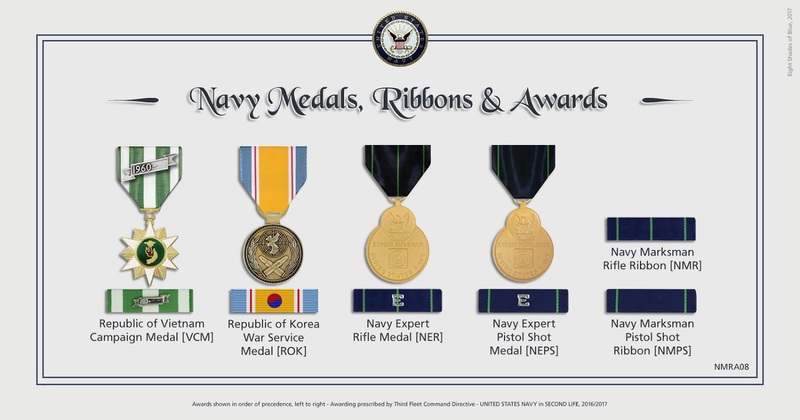 Can be earned six times, by adding a gold star to the medal cloth and ribbon for each additional award and a silver star replacing the set of five awards. The sixth award of this type makes one eligible for the Navy and Marine Corps Commendation Medal. 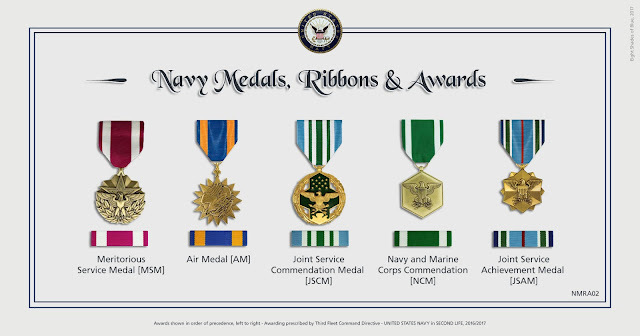 The Navy & Marine Corps Achievement Medal (NAM) is a decoration presented by the United States Department of the Navy to service members of the U.S. Navy and Marine Corps who have performed commendably in routine duties or exceptional achievements, that have not been recognized by a higher award. It was originally created to honor junior members who are not generally eligible for the Navy & Marine Corps Commendation Medal or the Meritorious Service Medal. 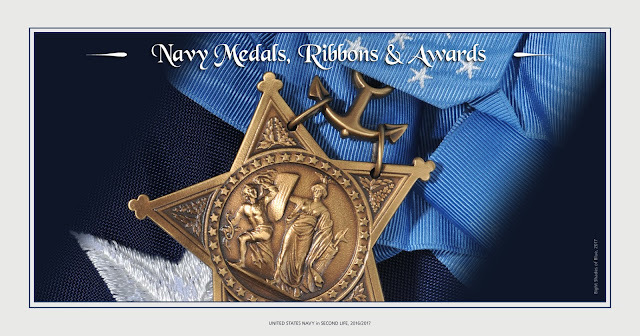 Subsequent awards are denoted by silver and gold stars worn on the ribbon. 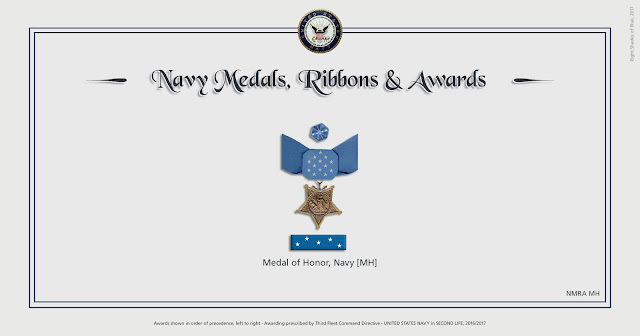 Earned by participating in VICE Combat while serving in Third Fleet with documented action - record of mission validity required and not applicable to training, practice or exercises. Equivalence granted to officers/enlisted who served one or more tours with a WW2 United States military group while in the the service with the USNSL who have that distinction awarded while in combat missions with the squadron/unit in Second Life. WW2 awards appearance will remain as it was in that period. Awards that have complete equivalence to this day have the same appearance. In case the award has degrees (1st class, 2nd class or others) the equivalence is granted when the highest degree is earned. The Combat Action Ribbon (CAR) is an award for Navy and Marine Corps personnel who render satisfactory performance under enemy fire while actively participating in a ground or surface engagement. Created in February of 1969, it was originally retroactive to March 1st, 1961 to personnel who met the requirements. However President Bill Clinton changed this requirement to December 7th, 1941 to include all personnel who participated in World War II. Additional awards of the Combat Action Ribbon are represented by wearing a Gold or Silver 5/16th inch stars on the service ribbon. For Third Fleet officers/enlisted. Earned when more than 50% of a command has been promoted at least once over a period of six consecutive months. 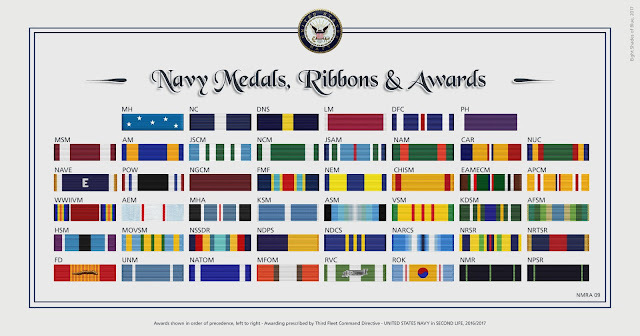 Can be earned multiple times, by adding a gold star to the medal cloth and ribbon for each additional award and a silver star replacing each set of five awards. The Navy Unit Commendation (NUC) is an award of the United States Navy that is used to recognize heroism and outstanding actions preformed by any ship, unit, aircraft or detachment of the Navy and United States Marine Corps. The actions need to be of the caliber that would earn an individual a Silver Star Medal. Units of other branches of the Armed Foreces are also eligible for the award as long as they are assigned or attached to Navy or Marine Corps units. Awarded to the crew of any Third Fleet vessel that has participated in at least five documented missions (training, practice and exercises not considered) involving more than one participant, over a period of six consecutive months with no interruptions, demonstrating battle efficiency. This demonstration of efficiency involves skill and it is not restricted to combat missions, also including air, sea or land missions that involve combat skills. The Third Fleet NAVE is worn with a single "E" device applied on the ribbon with no extra devices added. The Navy E Ribbon (NAVE) or the Battle "E" ribbon is presented to crew members of any United States Navy vessel that has won a battle efficiency competition. A unit award, this ribbon was created July 1st, 1974 the ribbon replaces a patch that, prior to the ribbons creation, was sewn onto the right sleeve. The first award of the "E" Ribbon is represented by wearing a Silver E device on the center of the service ribbon. Additional awards are represented by wearing a 2nd and 3rd E device until the 4th award, when a wreathed E is worn. After the 4th award, no additional devices are approved, and only the silver wreathed E is worn. None. This medal is not awarded in Second Life out of respect for real life POW's and veterans. For Third Fleet officers/enlisted. Earned for active service without disciplinary actions during a period of six consecutive months with no more than 15 days of interruption. 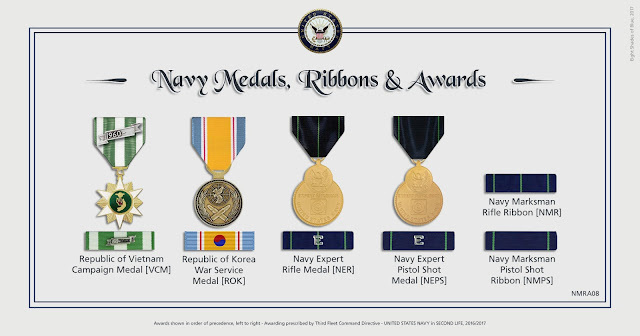 Can be earned multiple times, by adding a gold star to the medal cloth and ribbon for each additional award and a silver star replacing each set of five awards. For Third Fleet officers/enlisted. Deploy or drill with the Third Fleet recognized USMC groups/units or, as a Corpsman or Navy Doctor, participate in RP with members of the USMC in SL. The Fleet Marine Force Ribbon (FMF) is an award of the United States Navy that denotes that an eligible Navy service member (either enlisted or officer) has earned the Fleet Marine Force designation. Created in 1984 the ribbon was used to distinguish Navy personnel who were serving with qualified Marine Corps deployable units. It was made obsolete on October 1st, 2006 after the Fleet Marine Force Enlisted Warfare Specialist and Fleet Marine Force Qualified Officer Insignia were created. However, if the ribbon had previously been earned it is still approved for wear. For Third Fleet officers/enlisted. Earned by participating with at least another Third Fleet member or with other Naval Service officers/enlisted participating in at least two documented missions that result in gathering relevant information about Second Life regions with Third Fleet operational impact. No devices applied. Awarded to Third Fleet officers with documented service with the WW2 American Volunteer Group (AVG) "Flying Tigers" in Second Life, in any of the squadrons in the AVG structure. No devices added. Awarded to Third Fleet officers with documented service with WW2 aviation groups in Bastogne, Second Life, in any of the squadrons in the Bastogne WW2 structure. Awarded to Third Fleet officers with documented combat service with the WW2 American Volunteer Group (AVG) "Flying Tigers" in Second Life, in any of the squadrons in the AVG structure. The Asiatic-Pacific Campaign Medal (APCM) was awarded to any member of the United States Armed Forces who service in the Pacific Theater during World War II. It was created on November 6th, 1942 by President Franklin D. Roosevelt's Executive Order 9265. Additional awards of the medal are represented by a bronze star device worn on the award. There are 21 Army and 48 Navy and Marine Corps approved campaigns for this medal. An Arrowhead device is also authorized for campaigns which involved amphibious landings and certain sailors are authorized to wear the Fleet Marine Force device for combat operations. Awarded to Third Fleet officers with documented participation in any WW2 Allied military aviation group in Second Life, independent of nationality. Not awarded to Axis pilots. The World War II Victory Medal (WWIIVM) is presented to all members of the U.S. military who served in active duty or as a reserve during the period of December 7, 1941 - December 31, 1946. There is not a length of service requirement for this award. Awarded to Third Fleet officers/enlisted with documented participation in the exploration of the southern snow lands of the Samsara Continent in Second Life, leading to operational Third Fleet actions in the area or with relevant information retrieved about that area that may have operational impact. Exploration requires no less than eight documented missions in the area with other officers/enlisted participating with intent to achieve the goals stated, during a period of three consecutive months with an allowed absence of 15 days during that period. The Antarctic Expedition Medal (AEM) is a commemorative award that was issued for participating in Antarctica expeditions from 1928 to 1941. Replaced by the Antarctica Service Medal in 1960. Rescue at least 5 downed pilots or persons via documented CSAR/SAR USNSL operations. Same parameters as stated while serving with the SLCG, SICG or VCG. Less than 5 rescued pilots or persons will count towards the required rescued people total stated. Awarded to officers/enlisted on a tour in the East Sea (Korea) with at least two documented relevant missions in the area with other officers/enlisted participating. Awarded to Third Fleet officers/enlisted with documented participation in patrols of the southern snow lands of the Samsara Continent in Second Life. Requires no less than ten documented relevant missions in the area with other officers/enlisted participating, during a period of three consecutive months with an allowed absence of 15 days during that period, resulting in the gathering of information about the region that proves relevant to Third Fleet. 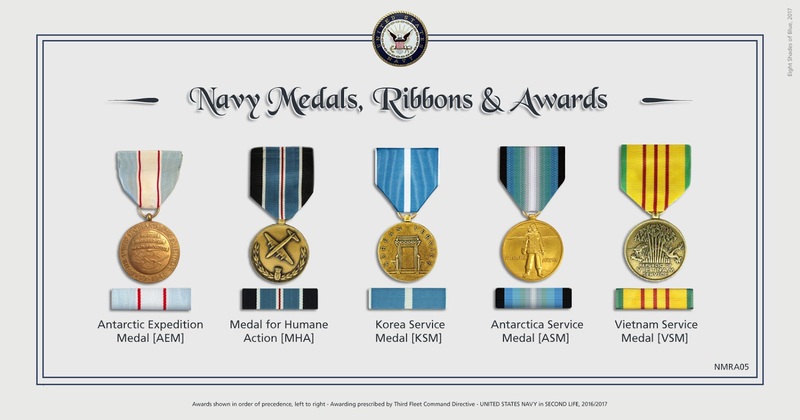 The Antarctica Service Medal (ASM) is granted to military members who serve between 15 and 30 days while stationed on the Antarctic continent which is defined as south of 60 degrees latitude. Flight crews that complete transport missions to Antarctica then qualify for one day of service for each flight mission carried out within a 24-hour time frame. For military members who serve extended winter service in Antarctica receive a Wintered Over Device. The Wintered Over Device is given to personnel in order to illustrate the number of winters served on the Antarctica continent. The ASM was established on July 7, 1960 and it replaced several commemorative awards that were issued for Antarctica expeditions from 1928 to 1941. Awarded to Third Fleet officers/enlisted deployed with the USS Kitty Hawk, CVN-63, in the Gulf of Tonkin or officers/enlisted on a tour with the USS Kitty Hawk in the Gulf of Tonkin with at least two documented relevant missions in the area with other officers/enlisted participating. Also awarded to officers/enlisted deployed to the USS Kitty Hawk in the Gulf of Tonkin as part of the Individual Augmentee Program (IAP). No devices applied. Awarded to Third Fleet officers/enlisted for participation in VICE combat training, practice or exercises taking place while in the East Sea (Korea), together with at least one other Third Fleet member or while in joint mission with members from groups recognized by Third Fleet. To be eligible for this award the awardee must have at least two documented VICE combat training, practice or exercises meeting the conditions stated, during a period of two consecutive months with no interruptions. The Korea Defense Service Medal is a decoration presented by the United States Armed Forces to individuals who served in the Korean Theater after July 28, 1954, following the signing of the Korean Armistice Agreement. To be eligible, service members must have served at least 30 consecutive or 60 cumulative days in the Korean Theater. Service time may be waived when a service member has required medical evacuation after having been wounded in battle or has served in aircrew flights that totaled more than 30 days of duty in Korean airspace. Awarded to Third Fleet officers/enlisted who partake in "significant activity" for which no other service or campaign medal is accredited. The term "significant activity" means in this instance actions deemed worthy of recognition by presentation of a permanent service medal that take place during a period of three consecutive months with 10 days of allowed interruption possible. No devices applied. Awarded to Third Fleet officers/enlisted who are active instructors at any recognized Naval Service training site (US Navy, US Marine Corps, US Coast Guard) for at least one academic/instruction cycle. The Humanitarian Service Medal is a decoration of the United States Armed Forces presented to any member of the U.S. military who has demonstrated commendable conduct in humanitarian military acts or operations. Military acts that the United States Department of Defense has authorized for this medal include natural disaster relief, humanitarian support of refugees or evacuation of non-combatants from a hostile area. Service members who receive the Armed Forces Service Medal or the Armed Forces Expeditionary Medal are not eligible for the Humanitarian Service Medal if it is for the same period of service. Subsequent awards are denoted by Service Stars worn on the service medal. Awarded to Third Fleet officers/enlisted who start or participate in five documented RP sessions at any Third Fleet location. Can be as simple as eating in the galley with a shipmate, going on patrol with a shipmate, standing watch with a shipmate, or so on, always with participation of at least one other USNSL member. To be eligible for this award the documented sessions must take place in active duty during 45 consecutive days with no interruptions. No devices applied. Awarded to Third Fleet officers/enlisted who complete Individual Augmentee Program (IAP) with any of Third Fleet or Seventh Fleet aircraft carriers. The Navy Sea Service Deployment Ribbon (NSSDR) is presented to any member of the United States Navy after they complete a deployment at sea. A standard deployment is considered 90 consecutive days or two periods of at least 80 days within a 12 month period. Additional awards of the ribbon are represented by wearing a Bronze Star device on the service ribbon. Awarded to enlisted who are deployed with the Navy Flight Demonstration Team as part of the "Fat Albert Airlines" detail, either as Fat Albert crew or NFDT ground crew, and complete a full tour of duty of one season, lasting 12 consecutive months with 2 months allowed absence during that period. A NFDT season starts January and ends December of every year. No devices applied. This ribbon is awarded on completion of a full tour of duty with the NFDT and replaces the Navy Distinguished Civilian Service Award ribbon awarded upon assignment to the first deployment with the squadron. 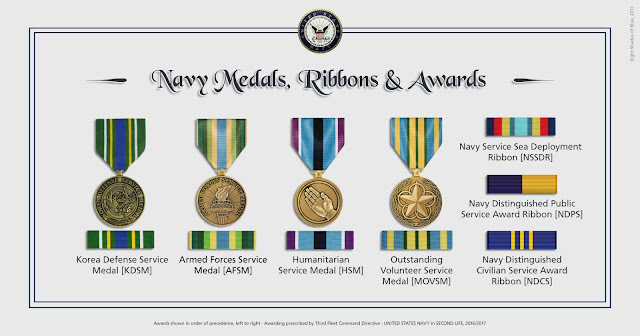 The Navy Distinguished Public Service Award Medal is a decoration presented by the United States Secretary of the Navy to recognize civilians who have provided exceptional services that have made a significant and positive impact on the Department of the Navy. 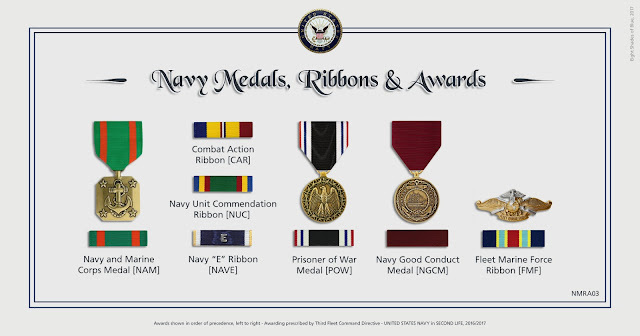 It is the highest honorary award that the U.S. Navy can bestowed upon a civilian not employed by the Navy, followed by the Navy Superior Public Service Award. Awarded to officers/enlisted who are assigned to the Navy Flight Demonstration Team for the first time in any capacity - from intern to crew chief or squadron pilot. The award is presented when the assignment orders are issued. This ribbon is replaced by the Navy Distinguished Public Service ribbon on completion of a full tour of duty with the NFDT, so it is typically worn during the first 12 months with the "Blue Angels". Awarded to Third Fleet officers/enlisted who serve or patrol in the COMNAVAIRNAU SNO area - snow lands - with at least ten documented missions in the area during a period of three consecutive months with an allowed absence of 15 days during that period, resulting in the gathering of information about the region that proves relevant to Third Fleet. To be eligible for this award the goals stated must be achieved with the participation of at least one more Third Fleet member or while in joint mission with members from groups recognized by Third Fleet. The Navy Arctic Service Ribbon (NARCS) is an award presented to any Navy Personnel who preform 28 days of service (consecutive or non-consecutive) above the Arctic Circle. It may also be awarded to qualified civilians and other U.S. Armed Forces personnel who preform the qualified service while working with the U.S. Navy. Those stationed at remote ice camps, or divers who work below the ice, may count two days of service for each day worked. Created in May of 1986, the ribbon maybe retroactively awarded to any personnel who preformed qualified service after January 1st, 1982. This award is only issued once and there are no approved devices to be worn on the award. Awarded to Third Fleet officers/enlisted who are responsible for the recruitment of at least two enlisted or commissioned officers. Awarded to Third Fleet officers/enlisted who volunteer as instructors and help graduate at least one enlisted and two commissioned officers. No devices applied. The Navy Recruit Training Service Ribbon is awarded for the purpose of recognizing enlisted members of the United States Navy who have served as Recruit Division Commanders. The award is presented after the completion of a successful 3 year tour of service, and additional awards are denoted by wearing a Bronze Service Star device on the ribbon. 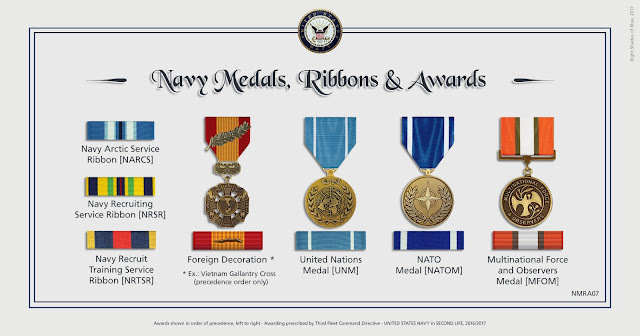 Some awards earned from a foreign military or civilian Second Life group may be worn. Such awards are always worn after all United States decorations and before international military awards. The awardee needs to verify with command if the award has been approved for display together with the national and international authorized awards. Note: Any WW2 era award from any of the nations enemy of the United States in that conflict are not authorized on the ribbon rack. Medals and badges from those nations are not authorized either. Authorized foreign decorations of the United States military are those military decorations which have been approved for wear by members of the United States armed forces but whose awarding authority is the government of a country other than the United States. The wear of foreign decorations may either be approved on a case-by-case basis or a general order may be declared allowing for blanket approval to all U.S. service members to wear a particular non-U.S. decoration. Awarded to Third Fleet officers/enlisted who, while on duty, participate in at least five joint operations/missions/events with one or more active duty members of a foreign armed forces group recognized by Third Fleet. No prescribed period limitations. This award is added to the Multinational Force and Observers Medal representing the sixth and subsequent, if any, missions of this kind; as such no devices are added to the UNM. Awarded to Third Fleet officers/enlisted with documented participation in the NATO groups in the Olds Field context. These groups have since been disbanded but were some of the most relevant military aviation groups in Second Life, with activities that ranged from aerobatics to aerial combat. Awarded to Third Fleet officers/enlisted who, while on duty, participate in at least one documented joint operation/mission/event with one or more active duty members of a foreign armed forces group recognized by Third Fleet. No prescribed period limitations. This award is enhanced by the United Nations Medal when the sixth documented mission of this kind is achieved; as such devices are only added to the MFOM medal cloth and ribbon to the limit of one silver star, in lieu of five gold stars earned. Awarded to Third Fleet officers/enlisted who participate in at least two documented missions of any kind involving other participants with 7th Fleet USS Kitty Hawk. The Republic of Vietnam Campaign Medal (VCM, VNCM) was a decoration presented by South Vietnam to recognize members of allied forces who served in the Vietnam War for a period of at least six months. Service members who were wounded, captured or killed in action were automatically awarded the medal regardless of time served. The "1960 Bar" device is given with the medal and was meant to indicate the years the war was fought from beginning to end. Since the Republic of Vietnam was conquered by North Vietnam in 1975, the government no longer existed and no end date was ever made for the bar. Awarded to Third Fleet officers/enlisted who participate in at least two documented missions of any kind involving other participants in Korea. Awarded to Third Fleet officers/enlisted who complete the rifle marksmanship exam during OCS/RTC with at least eleven targets shot over the required exam mark. The efficiency "E" device is applied to the Navy Expert Rifle ribbon. This award can also be earned at NSTC after the Marksmanship exam with another officer/enlisted present. Awarded to Third Fleet officers/enlisted who complete the pistol shot marksmanship exam during OCS/RTC with at least six targets shot over the required exam mark. The efficiency "E" device is applied to the Navy Expert Pistol Shot ribbon. This award can also be earned at NSTC after the Marksmanship exam with another officer/enlisted present. The Navy Expert Pistol Shot Medal is the highest award that a Sailor can receive for a pistol qualification. The current qualifying pistol is the M9. The medal is only worn if the recipient has achieved "expert" status with a qualified weapon. If they have achieved the expert status, the service ribbon is worn with a silver E device. A blank ribbon is worn if they have received the Marksman qualification and a bronze S device if they have the Sharpshooter qualification. First issued in 1969, normal qualification tests include shooting one-handed while kneeling and two-handed while standing. Awarded to Third Fleet officers/enlisted who complete the rifle marksmanship exam during OCS/RTC with at least ten targets shot over the required exam mark. If the number of targets shot exceeds the required exam mark by more than ten, the efficiency "E" device is applied to the ribbon and the Navy Expert Rifle medal is awarded. Awarded to Third Fleet officers/enlisted who complete the pistol shot marksmanship exam during OCS/RTC with at least five targets shot over the required exam mark. If the number of targets shot exceeds the required exam mark by more than five, the efficiency "E" device is applied to the ribbon and the Navy Expert Rifle medal is awarded. Precedence chart. Click to enlarge. That involves intent and documented work with enough mission time to accomplish the objectives. Example: To file a blank report with less then 40 minutes mission time and no other participants is not a relevant mission. That involves members of Third Fleet and groups recognized by Third Fleet as active partners.